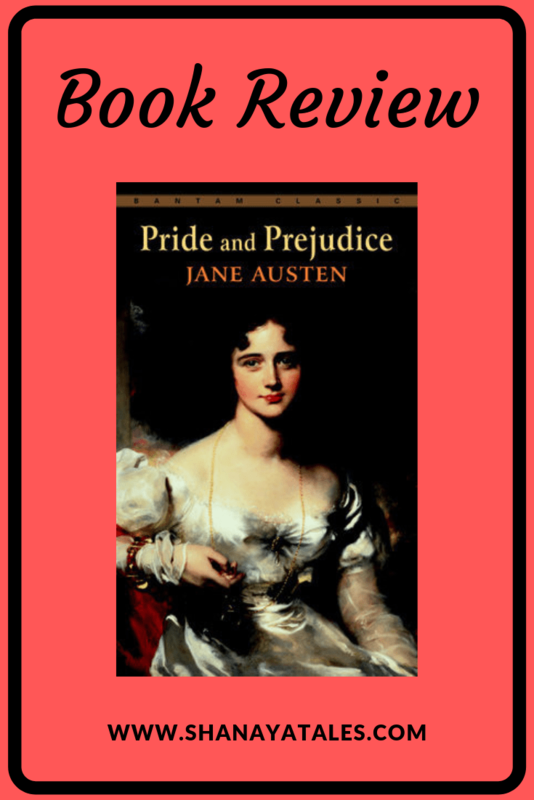 “It is a truth universally acknowledged, that a single man in possession of a good fortune, must be in want of a wife.” – Thus begins Pride and Prejudice – Jane Austen’s witty comedy of manners. If you notice, the very first sentence itself is a masterpiece of tongue-in-cheek social commentary, and instantly paints a picture of the socio-cultural situation of the era. You would think that it is representative of what is to follow; and to an extent, I would agree, but not really. It is just a very tiny glimpse of the mastery that Austen has over her craft. I could rave endlessly about the excellent plotting, or characterization, or even about how Austen’s wit and the wisdom reflects in the narrative. But I realize that anything that has to be said about this book, has already been said, in much fancier language than I can ever hope to express. Nonetheless, I am not going to let that stop me from gushing over it, because this has been more than just a book for me – it has been an experience – a very special one. It is special for many reasons – for one, the language is delightful beyond comparison. I used to be intimidated by old texts as they are often dry and difficult to read, but I truly loved the way some words are used in this book, and wished language would still be dealt with in the same manner. But I also wonder – is it really the language of the era, or a superior skill of presentation that Austen possessed? And secondly, I am amazed at how relatable and relevant this book is (even after 200 years of it being written!). The characters are interesting, the family dynamic is amusing, and kind of all over the place (but that is really how it is with all of us) – there’s love, loyalty, concern, annoyance, and exasperation even! Having said that, the first half of the book was kind of a slow burner, and while it was still interesting, it was going nowhere fast. But I labored through it, and the book just got better and better! The romance between Mr. Darcy and Miss. Bennet is not one that I am going to forget anytime soon. 2. I love Austen’s narrative style – we learn about characters and events as much from what they say to each other as from what she narrates to us. The banter between Darcy and Elizabeth isn’t empty flirting – it’s a progression, a chart, if you will, of their ongoing misunderstanding understanding , and a way to take stock of plot and character development, as well as an enjoyable display of wit. 3. I also liked the fact that the protagonists are not one-dimensional perfect people, but complex, flawed human beings. 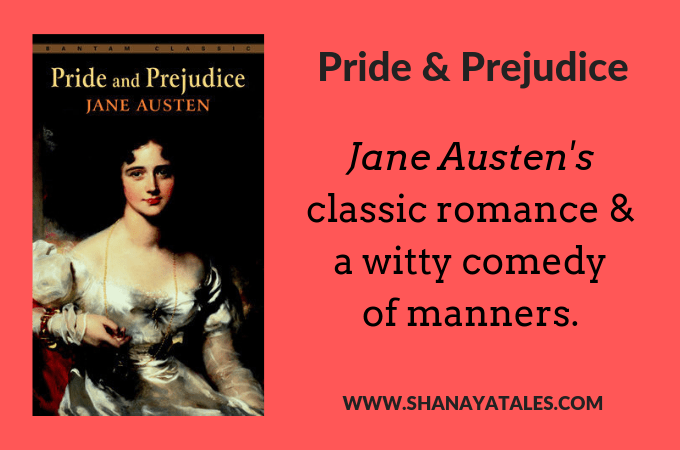 Infact, the personality defects of the protagonists are mentioned in title of this book itself; it alludes to the Pride of Mr. Darcy & the Prejudice of Miss. Bennet. And, importantly, these flaws are not used as backhanded compliments. Instead, the reasons are explored, and one can actually see the emotional development of a character as they come to terms with these flaws, and work on overcoming them. 4. The protagonists as well as the side characters have their own distinct personalities, and are very well fleshed out. There are no cookie cutter characters. For instance – Mr. Darcy, Mr Bingley, Mr. Wickham & Mr.Collins among the men; and Miss. Elizabeth Bennet, Miss. Jane Bennet, Miss. Georgiana Darcy, and Miss. Charlotte Lucas among women – they are as unique and different from each other as they can be. 5. Finally, I loved how emphasis was placed on mannerisms and good sense, over just good looks. The author did not rely on only good looks to make the characters endearing, which is such a refreshing change from some of the contemporary novels these days. I would love to hear from you guys. Have you read Pride & Prejudice? Who is your favorite character? (outside of Mr. Darcy, because let’s face it, he would top everyone’s list!) As far as I am concerned, I liked Lizzy as much as I liked Mr. Darcy (okay, that is not completely true, but close). Interestingly I also liked Jane, and that is a surprise even to me, because Jane’s naivete and innocence is not something that I can relate with, but I found it inexplicably endearing in this book. I read this while in college after I read Emma. There’s something captivating about the way she writes and describes. Brilliant would be an understatement. Exactly! I was at such a loss for words! Aww…I am so going to read this, yet again! When you announced you were going to read this one, I knew for sure, you would swoon over the characters….esp you-know-who! How did Austen manage to pull off such a magnetic, enigmatic character, I always wonder! It is indeed a classic! And my dear your review does it the very justice it deserves! Pride and prejudice is one of my favourite classics by Austen . The other being Sense and Sensibility . Austen has very well portrayed Lizzy Bennett as an independent woman . My favourite character other than Mr Darcy is The naive Mr Bennett who is tyrannised by his over ambitious wife . Am i the only one who still hasnt read it? But its not my fault. Blame it on the crappy movies which were made based on this book like bride and prejudice. Definitely picking this one up asap. Oh, please don’t judge it based on THAT movie! I have an adaptations post coming up, which might clear the air, but really – don’t let that movie color your mind about this book. That movie is just inspired by P&P – not even the same story! Its my favourite book. The only one I have read countless times. I would suggest, now you watch the BBC Series staring Colin Firth. I insist that you watch it. Colin Firth is the perfect Mr. Darcy. BTW, the book is free on Amazon Kindle. Oh this is so lovely! What a wonderful way to document your first Pride and Prejudice experience! It’s one of those classics that’s classic for good reason, you know? Such a fabulous story. What a wonderful review of Pride and Prejudice! You do entice those who haven’t read it to take the plunge. I must admit I’ve tried reading it and found it slow in spots but I do love the characters as you say. And the BBC movie of it can’t be beat. Colin Firth is dreamy as Mr. Darcy. No one else can ever come close in portraying him. Just like I adore Toby Stephens (Maggie Smith’s son) as Mr. Rochester in BBC’s production of Jane Eyre. I remember reading an article describing how Jane Austen is so good about showing the little nuances of human behaviour and relationships. Not every writer is so adept at this. Thanks for sharing your enthusiasm for this great classic. Shantala, it is one of the best blogs I have ever read on ‘Pride and Prejudice’. Thank you for this passionate post. 🙂 I read the book seven years ago, and I remember enjoying it then, despite having a love-hate relationship with it. 🙂 Now, after reading your blog, I intend to revisit it. Many thanks for inspiring. Awww, this post made me beam. I love seeing people newly discover books that I’ve loved for a long time. Has anyone yet recommended the webseries The Lizzie Bennet Diaries? It’s a modern-day video-blog adaptation of Pride and Prejudice, and it just couldn’t be more delightful. I highly recommend watching it! Pride and Prejudice is my all-time favorite romance. I’ve lost count of the number of times I’ve read it and your review makes me want to read it all over again. Well done, Shantala! The way she has written Elizabeth’s character shows that Jane Austen was way ahead of her time. Colin Firth is drool-worthy as Mr. Darcy on the BBC series. My favourite read of all times. I’ve lost count of the number of times I’ve read it and the related serials, movies and books I’ve read. 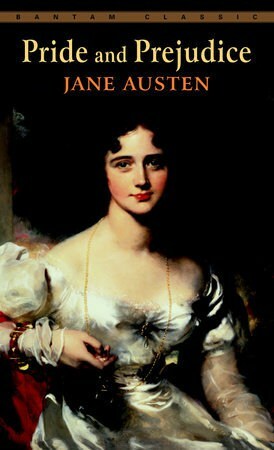 I’ve read all of Austen’s works at least thrice but P&P is the best! I recently re-read P&P because it’s just such an epic, wonderful book. Love your review! What do I even say about this book? I have read it many times but not recently and then the movies and the TV series. Just a fabulous classic! Truly fabulous! I re-read it, and then watched the adaptations – the BBC one is perfection! It has been ages since I read this English classic. I was just a teenager at that time, I think. But I remember enjoying it very much, could be my age 🙂 Read a few of her other works too, one after another. But that was then. Haven’t picked up any Austen for many decades, just not my cup of tea anymore. Beloo Mehra recently posted…Why Nationalism? I cannot tell you how happy I am that you read it. It’s like sharing a treat with a person who you know is going to like it as much as you. A more gushworthy book there never was. On a somewhat related note – have you seen Lost in Austen? I haven’t. But then I haven’t read her other books. Does Lost In Austen touch on the other books, or just P&P? Have you read it? How did you find it? Lost in Austen isn’t a book at all. It is a mini series where a modern day protagonist gets swapped with Lizzy in Pride and Prejudice. Oh I see. But there is a book by that name too. Lost in Austen: Choose your own adventure. Anyway, how did you find the mini-series? Worth a watch? Reading all the good reviews on various sites, I feel like going for these great books – however, time plays a spoilsport! I re-read Pride and Prejudice last year and simply loved loved it. In fact because of this book, I am planning to read some more classics again. Oh Darcy is my fav beyond a doubt. But I liked Elizabeth a lot too. Good.. now you should watch the TV series 😀 And I need to read this book again soon. Love this one to the core!!!! A detailed and comprehensive review. The book is timeless and makes sense to any generation. What a command over the language and relatable style. This one never gets old..hollywood came with an adaptation termed Pride and prejudice and zombie,the whole notion recieves a gothic touch ..do watch it. I think it is time to revisit this book, had read it ages ago. It will always be a great read. Excellent gushing Shantala!! I hv this book resting in my shelf for months. Your rating with the stars and the moon is forcing me to consider reading it asap.